Born on March 13, 1899. Emeritus Hollis Professor of Mathematics & Naural Philosophy, Lyman Laboratory of Physics, Harvard University Cambridge, Massachusetts, U.S.A.
Honorary degres from 7 American Universities and from the Universities of Grenoble, Nancy, Oxford & Paris. 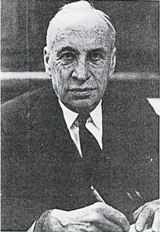 Correspondant, Academie des Sciences, Honorary member, Societe de Physique, Foreign member of academies of Netherlands, Sweden, Uppsala, and of the Royal Society, Medal of Science, U.S.A. Nat. Acad. of Sci., U.S.A.
"Quantum Principles & Line Spectra" (1926). "The Theory of Electric & Magnetic Susceptibilities" (1932). Most of his research work has been concerned with the quantum-mechanical theory of magnetism, and related topics in ligand or crystalline field theory including such topics as the general formalism correlating the magnetic susceptibility with the behavior of the quantized energy levels, explanation of the magnetic susceptibility of nitric oxide, of samarium and euronium salts, the diverse behavior of nickel and cobalt salts, weak paramagnetism, etc. His doctor's thesis (1922) was an attempt, of course unsuccessful, to calculate the binding energy of the helium atom in the old quantum theory. A few of his papers have been concerned with dielectric constants rather than magnetic susceptibilities, two subjects closely related. In the 1930's he published some primitive calculation dealing with the relation of the Hund–Mulliken and Heitler–London–Slater–Pauling theories of chemical bonding.